What is a True Mirror? What is the adjustment for? Why do some people think they are so crooked in the True Mirror? Whats the point of having one? 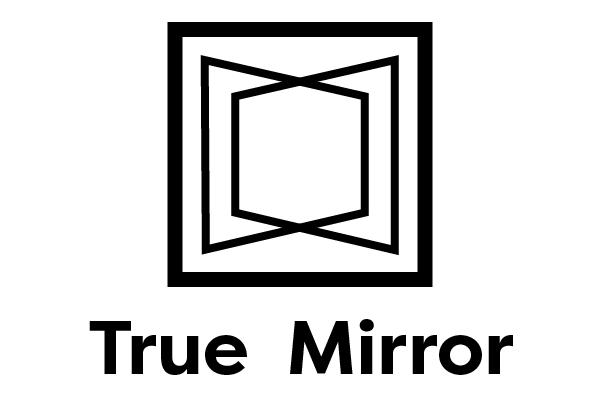 A True Mirror® is an optically perfect (or as close to possible perfect) non-reversing mirror. It is formed by taking two special “front-surface” mirrors and joining them at exactly 90 degrees to form a seamless, 3 dimensional, non-reversed image. Any two mirrors can form a non-reversing image, but making it seamless is critical for it to be used for accurate eye contact. Without the special mirror, there is always a gap in the middle, right through your eyes, and if the angle is not 90.00 degrees, there is a distortion in the center. We spent years trying to figure out how to make these reliably – there are more than 20 design elements that are needed to get it right. The optics of a perfect true image reflection requires the angle to be literally 90.00 degrees(!) Even if it gets set properly once, the expansion and cooling of temperature and humidity will change that angle by the slightest amount. Your eye can tell if it is off, because there is a more visible line in the center. A simple half turn of the adjustment knob will re-align it. Depending on how much the environment changes, it may need adjustments once a day or once a month. The feeling of striking and often disconcerting asymmetry (crookedness) in the True Mirror is a function of how our minds have a pretty burned in view of our faces, similar to the shadow you will see on a computer monitor that has the same picture on it all the time. Now, with the face flipped from what is usually seen, the mind plays tricks trying to reshape our faces with what we are seeing. Any asymmetry is now in the opposite direction, which doubles the actual perception to you the viewer, but that’s not actually real. For instance, if your nose tilts to the right by one degree, that’s close enough to straight, but now it looks like one degree to the left, which is TWO degrees from what you thought was straight. But when people view you, all they see is the one degree, without anything to compare to – and that’s essentially as straight as you thought in the mirror. It also is confounded by head tilts – we all do it to one degree or another. In a mirror, your head tilts the same way regardless, whereas the True Mirror image is tilting the other way. Your dominant eye is the right spot, but the rest of your face is skewed higher or lower. Again, this is a perception trick your mind is doing – to minimize, keep your head level. Over time, that sense goes away, as you just focus in on the eyes as they are actually positioned and the skew is not perceptible anymore. But clearly, this is the biggest reason for not liking the True Mirror – and its unfortunate. Your reaction to thinking your face is crooked is probably not your best expression, whereas if you can relax and just be yourself, all the other elements (including all the positive ones) can become visible in the True Mirror for you to interact with and process properly. We counsel people to give it about 30 days for the asymmetry effects to start disappearing and the face to be seen as it actually is. This is a great question that is still finding answers as people are discovering what seeing the truth about themselves means and what they will say to themselves in this new version. At the same time, seeing the accurate self puts to question what the backwards mirror has been showing for so long. Literally since childhood, we all have been looking at an altered version of us, one that is missing some key elements of our expressive personality…the elements that the world sees and know us for are simply not there. What has that done to all of our individual as well as collective psyches? Its an amazing question, one that is worthy of a twilight zone episode, except that this one is real! We are actively seeking to have the True Mirror researched for understanding the effects and benefits of a true image. Expect to see published papers that quantify and qualify what is going on, and putting it into the context of our overall self-awareness and understanding. A tool like this will find a great symbiosis with so many of the other ways we learn about who we are, how we are, and perhaps even why we are. Alternatively, you can try to see a bit of the effects by holding two mirrors at right angles…there will always be a gap, but if you use thin mirrors, you can almost ignore the gap. Try to communicate to yourself this way, not just staring, and you may be able to have that “Aha moment”, when you see the light in your eyes, along with the comprehension that the light is communicating!